Disney Interactive Studios has launched Disney Epic Mickey exclusively for the Nintendo Wii, a new video game that casts the iconic Mickey Mouse as an action hero. In the game, Mickey is set loose in in a Wasteland (which he inadvertently created, in a nod to Fantasia) with only paint and paint thinner to try to save the world and its cartoon characters. 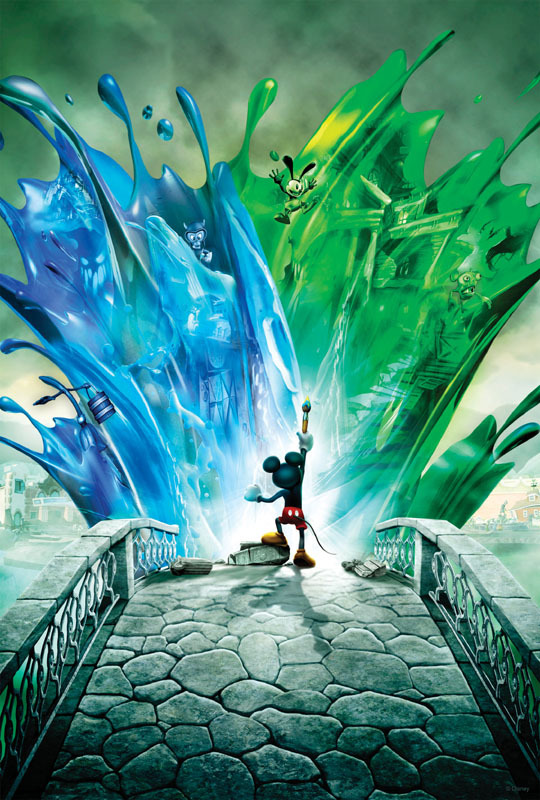 Disney Epic Mickey takes the form of a platform game in the Mario tradition, but also incorporates elements of RPG games and enables players to come up with their own solutions to getting through levels. And, as well as embracing Disney’s creative history with paint and paint thinner, the game incorporates a morality system that determines what side-quests, powers, and bosses Mickey will face. Disney Epic Mickey also marks a first for the Disney company: the re-introduction of the character Oswald the Lucky Rabbit. Oswald was actually Walt Disney’s superstar animated character before Mickey Mouse; however, Disney lost the rights to Oswald in a dispute with Universal. However, in 2006, Disney reacquired rights to Oswald as part of a larger deal with NBC Universal, and Disney Epic Mickey marks the first time since the 1920s that Oswald the Lucky Rabbit has appeared in a Disney production—in the game, he plays Mickey’s older half-brother. Although Disney’s Mickey Mouse franchise has been a perennial best-seller—and a reason behind the extension of U.S. copyright laws—Disney has yet to translate the character into a mainstream video game success. However, Warren Spector has high hopes for building a gaming franchise based on the idea of Mickey Mouse as a heroic character, rather than a lovable plush toy. Accordingly, Disney Epic Mickey is considerably darker than other Mickey material—although the title still manages an E for “Everyone” rating from the ESRB. Disney Epic Mickey is available now for a suggested retail price of $69.99.